CLICK HERE FOR INTERACTIVE GOOGLE MAP After each spring thaw, the Waterway’s historic locks and canals open, linking a passageway so magnificent it has been named “one of the finest interconnected systems of navigation in the world”. While most of this waterway is speed restricted, some parts are not. That’s where we ride – unrestricted zones. Our main tour begins in Sparrow Lake where the Trent system opens into Sparrow Lake from the South (Map Point A44.798556, -79.392035) at Lauderdale Marina . This speedy trip is great because even if it’s windy, the first part of this tour can be done in smooth water. Our first stop is Swift Rapids Lock #43 Map Pont B). It’s a big drop of 14.3 metres! Once through, we proceed at high speed to the next historic lock called the Big Chute lock #44(Map Point C) with a ride on a “rail car” down 17.7 metres. Again, at a good pace we cut through the canals to Port Severn lock #45 (Map Point D) with only a 3.7 metre drop into Georgina Bay. From here it’s just a short jaunt to Honey Harbour for lunch and fuel. If the wind is not cooperating, we will use this lock as our turn-around point and head back to our launch point. From Honey Harbour to San Souci is a big ride on some open water without too much shelter. This part of the tour would only be attempted if the winds are rated as “calm” from the Georgian Bay NOAA Bouy. In the old days, we used to have lunch at the famous Henry’s Fish and Chips, refuel, then reverse course and head home. Since Henry's closed for good in July 2017, we'll now head east into Wood's Bay for a ride on the Moon River (Map Point H), eat at the chip truck at the Moon River Marina (Map Point G) and refuel. On the way home, if there is time, it’s nice to shoot eastward into 12 Mile Bay (Map Point I) then back out again to resume the trip back to Honey Harbour. It’s important to watch the time of day as the locks close at 7:00 pm sharp. We must be back to the Swift Rapids lock by 6:45 at the latest. If we are too late it’s a long walk home! Our tour begins at the Beacon Marine where the Point au Baril channel meets Highway 69 at Map Point A (45.594597, -80.379963).They have a really good boat ramp and plenty of parking. Clean bathrooms anddrinks/snackshelp to get the tour off to a good start. Heading west out of the channel near Georgian Bay proper is the Point au Baril Lightstation which is a great place to snap a few pictures for the photo album. Another 100 yards west you will see a Barrel on a metal post marking the entrance to the channel at Map Point C (which is behind Map Point B on the map above). From Point au Baril we head north to the Byng Inlet Map Point D (45.758721,-80.646521). This channel extends eastward to highway 69 past the Town of Bitt. The channel is narrow enough to always have calm water. The return trip back out to Georgian Bay is quick as we head north again to Key Harbour Map Point E (45.888903,-80.733511). The Key River which at first looked too narrow and shallow to run all the way to highway 69 turned out to be just fine. We had asked a local fisherman to make sure it was passable for Seadoos(keep in mind the weeds!) At Highway 69 you can go under the bridge and park atKey Marine and have lunch at the Fast and Feast (and Esso Station). The Fast and Feast (formerly named Little India) has great East Indian food as well as standard Canadian lunch fare. The married owners, both from East Asia, own the restaurant, gas station and marina. She is a medical doctor and he is a chopper pilot. They were very accommodating and super friendly. Returning to the mouth of Key Harbour it was time to fuel up for the ride back. The Key Harbour Lodge at Map Point E (http://www.keyharbourlodge.com/) has plenty of fuel but a rather high wharf to climb up on to. From here, we travel south again to the Henvey Inlet at Map Point G (45.893301,-80.564033). It’s a pretty inlet almost devoid of houses. It’s a fairly short trip as it narrows about 2/3 of the way to Highway 69 and becomes weedy. From the Henvey Inlet it’s a straight south run back to the entrance of Point au Baril at Map Point C and back to Beacon Marine to load up the machines. As far as scenic tours go, this is a group favourite. It may even be the best tour we have. It has lots of protected, rocky runs that are well marked by the bouys. There are only about 12 miles (each way) that are completely open to Georgian Bay. The rest are all protected waterways. A GPS/chartplotter is a must on this tour as there are so many rocks to hit. The saying of the day was “don’t stray”. The native peoples called this region the “Garden of the Great Spirit.” Today, many people still remark that this gorgeous garden of woods and waters is truly one of the most beautiful places on the planet. The region extends from Kingston to Brockville on the Canadian side and from Oswego to Morristown on the US side. This 90 mile ride takes you from our starting point at the Glen House Resort just west of Ivy Lea (Map Point A N44.348987,W76.046891 ), under the Thousand Islands International Bridge over to Heart Island and Boldt Castle for the water view of this magnificent piece of history. It’s important to note that being in US waters with the intention of landing on US soil, a stop must be made in Alexandria Bay (Map Point B N44 20.169, W75 55.191) to register with customs at their video booth with your passport. The video booth is located at the foot of James Street. It is much faster to do it here than at Boldt Castle. From Alexandria Bay, the tour goes East passing incredible island real estate and Singer Castle on our way running the shore of the US side to our turn-around point, the Prescott Ogdensburg International Bridge (Map Point C). From the bridge at Prescott, the tour heads west along the Canadian shore back to Brockville for lunch and refueling at Blockhouse Island (Map Point D). Leaving Brockville, we continue west along the Canadian shore eventually returning to our starting area. One more pass by Boldt Castle and we are on our way east again along Wellesley Island to its eastern opening to turn around and head west through the middle of Wellesley Island in a channel that straddles the Canadian – US border. The channel eventually goes under the Thousand Islands International Bridge once more at the exact point of the border crossing then narrows further to almost a creek with a strong current then back out on the Canadian side with a straight run back to the Glen House (Map Point A) to end the ride. The 70 mile tour encompasses Upper Rideau Lake, Big Rideau Lake and Lower Rideau Lake. This area is well known for its historical significance as it connects to the Rideau Canal which is a UNESCO World Heritage Site, the only such site in all of Ontario. 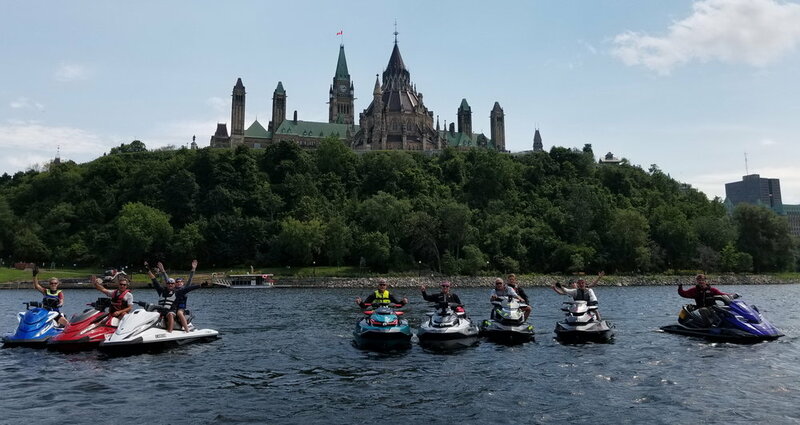 The tour starts with a beach launch (Map Point AN44 40.267 W76 22.153 ) near Westport and goes along the north shore of Upper Rideau Lake until we reach the lock that connects Upper Rideau Lake with Big Rideau Lake at the “narrows”. We continue along the north shore going in and out of the bays along the way to Lower Rideau Lake which starts at Rideau Ferry. Despite the name of the community, there is no ferry service operating at Rideau Ferry in the present-day. A bridge was constructed to allow passage across the Rideau in 1874, allowing travellers from Brockville or Kingston to more easily cross the Rideau to travel to Perth. See the interesting history of Rideau Ferry here – the local legend is worth the read. Continuing eastward through Lower Rideau Lake we head towards the Rideau canal that leads into Smiths Falls. The narrow run is great as a “speed run” with many twists and turns as you approach the turn-around point (Map Point B). We won’t go right to Smiths Falls as it becomes a speed restricted area. The all-important patio lunch is at Rideau Ferry on the north side at the Shipwreck restaurant. The return trip backtracks to our starting point but follows the southern shore. This leg is a bit longer but usually 1 tank of fuel is enough for this entire tour of the Rideau Lakes. If there is enough fuel we can venture into Westport but the weeds in this marina can be too much for a PWC. This tour is usually considered to be the first day of a trip to the 1000 Islands as you can do it in an afternoon then head to the Glen House in Rockport for a great Prime Rib dinner. North Channel – 130 Miles See pink granite islands, millions of years old, covered with windswept pines scattered throughout a 120 mile expanse of the bluest freshwater in the world. This supreme waterway offers breath-taking scenery and is within close reach of services and amenities. Anchorages in the World!”. The two principal islands, North Benjamin and South Benjamin, are skirted by a number of smaller rocks to the southeast, known as The Sow & Pigs and The Boars. This is a wonderful area to explore by Seadoo as some of the passages between islands and within islands are very shallow – too shallow for most boats. Once leaving the Benjamin Islands the tour reverses course and heads back to Little Current for refueling. On past the Swing Bridge and a straight run back to Kilarney for dinner. Herbert’s Fish and Chips on the wharf is nothing short of fantastic. Whitefish and pickerel from the fishing boats to the fryer is less than hour. Watch the expert filet team in the back shop prepare your filets before settling in for a feast. If we have time, a half day 45 mile trip takes us south east of Kilarney to Collins Inlet (Map Point F) all the way to its exit into Georgian Bay (Map Point G). From here you can either reverse course or head out a follow the shoreline. There are a ton of underwater hazards so a reverse course is safer. See video below by Discovery Yacht Charters for a slower view of the North. Our main tour begins in Waubaushene at the Central Marine (Map Point A). This speedy trip is great but only if its not windy. Once out of the marina area, we head towards Port Severn but take a hard left into the Potato Island Channel. Near the end of the channel, make a hard left through the narrow "zip channel" then turn right to continue towards Honey Harbour. Proceed out into the bay sticking close to the markers. To the right is a minefield of shoals that you don't want to go through. Once at the yellow marker (Map Point D) you can turn right and head to wards Honey Harbour (Map Point E). Just before entering int the big bay again, we cut behind Tomahawk Island (Map Point F) to start our inland route (Map Point G) north. Depending on time and fuel, we may duck into Go Home Bay (Map Point H) and down the river inland. Its a good idea to have extra fuel with you if you want to go to the end point and return. King Bay Marina (Map Point I) has fuel and a lunch spot except Mondays and Wednesdays. They do have some junk food if the kitchen is closed. 12 Mile Bay is a great speed run if you have time. There is also fuel halfway down the bay at Moose Deer Point Marina (Map Point K). On our way to Parry Sound we go right past Frynig Pan Island (Map Point L) and the old Henry's Fish and Chips restaurant which closed for good in July 2017. You can get fuel on the island but it can be over $2.10 per litre. From Here its another 15 miles to Parry Sound where we fuel up at the Parry Sound Marina Map Point M) prior to having lunch at the Bay Street Cafe (Map Point N). On our way home we can stop into Woods Bay via the Captain Allan Strait. Once in the bay, turn right to go down the Moon River to the Moon River Falls (Map Point P). Refuel at the Moon River Marina (Map Point Q) and grab an ice cream. They also have a chip truck most of the days of the week. Following the same way out of this area, we then reconnect with the markers than run north-south and head south to the mouth of 12 Mile Bay (Map Point J). If we didn't run it on the way up then we can run it now. If we do run it then once you head south again past Odonnell Point (big red and white can), fuel up at King Bay Marine (Map Point I). If we didn't pop into Go Home Bay (Map Point H) on the way up to Parry Sound then we can run it now. From here, we follow our original route home using the inland route described earlier all the way back to Honey Harbour. If there is time, you can stop at Picnic Island before you leave the area to grab a good ice cream. From Honey Harbour its 11.2 miles back to our launch point in Waubaushene. This is usually a speed run. Depending on where we fueled up last, your machine will start giving the low fuel warning along the way. No worries though, we have always made it! Our tour starts at a dockless Monaghan Boat Ramp (Map Point A 44.274213, -78.322960 ) in Peterborough, just under the bridge. The ramp is never busy and has great parking for the trailers. The tour starts here as there is no speed limit for the river once under the bridge heading south! For almost 20 miles, the Otonabee River, part of the Trent-Severn Waterway, river twists and turns and is a perfect “race-course” for PWCs. The river empties into Rice Lake (Map Point B) at its western end. The lake is fairly shallow and was named for the wild rice which grew in it and was harvested by native people of the area. Most of the extensive stands of wild rice originally found in the lake were wiped out when water levels were raised in the lake during the construction of the waterway. From here, if the lake isn’t rough, we will take a short trip to the very western end to a place called Bewdley for a quick refreshment. Heading east, we travel the entire length of Rice Lake along the south shore to our only Lift Lock (Map Point C) in Hastings. You should refuel at one of the marinas on the south shore before heading to the lock. After Hastings, it’s another 14 mile river run all the way to Healey Falls (Map Point D). This is usually a good spot to get off the machines and take a walk to see the falls (see Falls click here ). This is the end of the tour west as the next lift locks (#16 and #17)are “flight locks” which take you down 16.4 metres to a speed regulated zone – no thanks. On our return, lunch is at the lovely Terrace Lawn Cottages and Marina (Map Point E). It has a wonderful chip truck run by the owners, Catherine and Don, who are incredibly gracious hosts. Once we are underway, and back through the Hastings lock, take on a bit more fuel at the marina, and it’s a straight run back to the entrance of the Otonabee River and another 20 mile “speed tour” back to our launch point (Map Point A). This 2,500-square-mile natural playground includes 8,699 miles of shoreline; 17 historic towns and villages; and countless waterfalls and lakes bordered by the granite peaks of Algonquin Provincial Park to the east and the 30,000 islands of Georgian Bay Islands National Park to the west. Immediately you will feel the magic of the region with the granite rock of the Canadian Shield surrounding you, the roar of our many picturesque waterfalls and the charming beauty of the magnificent real estate that that leaves the traveller in awe of cottage architecture. Our tour is “limited” to the three major Muskoka Lakes, namely Lake Muskoka, Lake Rosseau and Lake Joseph. After lunch and refreshments, our tour takes us up the Joseph River (Map Point E) into Lake Joseph where we head NorthWest for Gordon Bay Marine in Gordon Bay (Map Point F) at the top of the lake. It’s usually worth the effort to go under the bridge and go into Portage Lake for a quick speed run around this little lake. From here it’s a straight run down the west side of the lake to Port Sanfield (Map Point G). If there is time we may stop at the Lake Joseph Club patio. Going North then East we travel back to Port Carling, through the lock and start heading South again. If time permits, we'll a short trip over to Bala (Map Point H) for ice cream. From there it's back out to the big part of Lake Muskoka for the final leg home through the Light House Narrows (Map Point I) and the starting point, the Muskoka Wharf (Map Point A). The term Kawartha is an anglicization of the word Ka-wa-tha (from Ka-wa-tae-gum-maug or Gaa-waategamaag, meaning), a word coined in 1895 by aboriginal Martha Whetung of the Curve Lake First Nations. The word meant “land of reflections” in the Anishinaabe language, according to Whetung. The word was subsequently changed by tourism promoters to Kawartha, meaning “bright waters and happy lands.” There are over 60 named lakes but there are actually over 250 lakes in the Kawartha region. The Trent Severn Waterway traverses through the Kawarthas via a network of navigable rivers and locks linking the Pigeon, Sturgeon, Cameron, Balsam, Mitchell, Scugog and Canal lakes. Our tour begins at the Long Beach Marina (Map Point A) on the west side of Sturgeon Lake and heads east along the southern shore all the way to Bobcaygeon for our first lift lock (Map Point B – lift lock #32). This is where the Trent Severn Waterway all began in 1833 the canal’s first lock was built here to serve the community’s bustling lumber industry. Once through the lock we enter Pigeon Lake and head south to the Gannon’s Narrows (Map Point C). Heading east through the bottom of Buckhorn Lake and over to Chemung Lake, we take a quick spin to the southern end (Map Point D). Heading North again we reenter Buckhorn Lake and head to the town of Buckhorn and the Main Street Landing Patio and Restaurant for a refreshment at the entrance to the lock #31 (Map Point E). Through the lock heading east we traverse the length of Lower Buckhorn Lake to Lovesick Lake and Lock #30. A quick run through Lovesick Lake takes us to Burleigh Falls and Lock #28 (Map Point F). At this point it is worth refueling at the Burleigh Island Lodge before heading into Stoney Lake. Stoney Lake has its name for a reason. It has even more islands than the famed 1000 Islands region of the St. Lawrence River. If you don’t have a GPS with BlueCharts or a chartplotter, this is a risky proposition. We head east in Stoney along the southern shore for its full length to Map Point G in Upper Stoney Lake. This is our turn around point. We now head west along the northern shore to the Viamede Resort (Map Point H) for a snack. After the Viamede, we continue west to Hells Gate (Map Point I) and down into Clear Lake to its southern most point (Map Point J). Returning to Hells Gate then heading west, the Burleigh Falls Lock is our next destination. From here we follow our incoming route all the way back to the top of Pigeon Lake and based on the time of day and when the Bobcaygeon lock closes, we can head east all the way to Big Bald Lake to Crocodile Bill’s Pub and Grill and the Catalina Bay Resort (Map Point K). It’s usually pretty late in the day by the time we finish up at the Catalina Bay Resort, so getting back to the Bobcaygeon lift lock on time for closing is crucial. If you don’t make it, it’s a long walk/cab ride back to get the trucks and trailers. In the summer, the locks close at 7:00 pm so we need to be waiting in line for the lock at 6:30 pm. Once through the lock, it’s a straight run back to our launch point at Long Beach. With any luck, the wind didn’t pick up in the afternoon because usually the prevailing wind comes right down the chute and there is nowhere to hide on Sturgeon Lake. This can be a big ride so eat your Wheaties! The Bay of Quinte is a long, thin bay shaped like the letter “Z” on the northern shore of Lake Ontario in the province of Ontario, Canada. It is close to the mouth of the Saint Lawrence River that connects the Great Lakes to the Gulf of Saint Lawrence. The width of the bay rarely exceeds two kilometers. The Quinte area played a vital role to bootleggers during Prohibition in the United States, with large volumes of booze being produced in the area, and shipped via boat on the Bay to Lake Ontario finally arriving in New York State where it was distributed. Illegal sales of liquor accounted for many fortunes in and around Belleville. Our tour begins in Trenton, at the mouth of the Trent River (Map Point A) and heads east along the north shore into the Bay of Quinte. Near Belleville, we pass under the beautiful Bay Bridge. At the base of the southward slope of the “Z” lies the Prince Edward Yacht Club which was established in the 1930’s (Map Point B). It’s worth dropping in to see the wide array of vessels docked there. It’s a good idea to get fuel here as the full run to Kingston exceeds our fuel supply. From here we head east again towards Kingston. Its worthy to note that this trip should be chosen carefully based on wind conditions. The openings on either side of Amherst Island give a full blow of wind and waves off Lake Ontario which can be quite formidable. Once in the Kingston area (Map Point C), we can relax and head towards the downtown core which has plenty of paid (yikes!) parking for PWCs and boats. There are numerous patios to choose from on the main street but our favourite is the Prince George Hotel. The hotel is situated on Ontario Street, Kingston’s waterfront, which was a most convenient set up for the local bootleggers who ran liquor up and down the lake during prohibition. The hotel, constructed of limestone, as most buildings in Kingston are, was built over 195 years ago in 1809 and has been used as a hotel for the past 150 years. It houses a lively Irish pub known as Tir nan Og. It is said that the hotel is haunted by the ghost of Lily Herchmer, who died in a fire on this site, waiting for a sailor with whom she fell in love. A few neat facts but the best of all is that their refreshments are ice cold and the food is tasty! Fueling up again in Kingston, we head back the way we came. Watch for marinas along the way to refuel once again before the last stretch back to Trenton. There are plenty to choose from but some may close at 5:00 pm. At the time of the first European contact in the 17th century the lake was called Ouentironk (“Beautiful Water”) by the Huron natives. It was also known as Lake Toronto until it was renamed by John Graves Simcoe, the first Lieutenant-Governor of Upper Canada. The name ‘Toronto’ found its way to the current city through its use in the name for the Toronto Carrying-Place Trail (or Toronto Passage), a portage running between Lake Ontario and Georgian Bay, that passed through Lake Toronto, which in turn was used as the name for an early French fort located at the foot of the Toronto Passage, on Lake Ontario. The Severn River, its outlet stream, was once called ‘Rivière de Toronto’ which flows into Georgian Bay’s Severn Sound, then called the ‘Baie de Toronto’. Lake Couchiching was at one time thought of as a third bay of Simcoe, known as the Bristol Channel; however, the narrows between the two bodies of water separate them enough to consider this to be another lake. The Trent-Severn Waterway is the most important river draining into Lake Simcoe, connecting the lake with the Kawartha lakes system and Lake Ontario. From its connection to Lake Couchiching, the Severn River is the only drainage from the lake to Georgian Bay, part of Lake Huron (Simcoe itself is not one of the Great Lakes). Our Tour begins at the launch ramps in Beaverton (Map Point I) and continues in a counterclockwise direction past Beaverton and Lagoon City (Map Point A). On our way to the narrows, which connect Lake Simcoe and Lake Couchiching, we pass by Strawberry Island. It is operated as a retreat for Basilican monks. On previous visits to Toronto, Pope John Paul II has stayed here. Through the narrows at idle speed (Map Point B), we continue north into Lake Couchiching and along its eastern shore. By the time you reach the northern 20% of the lake, even PWCs should fall in line in the marked channel as the lake becomes rather shallow in places with enough submerged rock to ruin your day. The Trent Severn waterway continues from here at idle speed for the next 6 miles into Sparrow Lake. This is our turn around point (Map Point B). From here we head south to Orillia for some refreshments (Map Point D) at Couchiching Beach Park. A quick trip back to the narrows and a refueling stop, we head back into Lake Simcoe and tour along the western shore to Kempenfelt Bay. At the end of the bay lies the City of Barrie which is our lunch stop (Map Point E). We can walk from the public docks to a variety of restaurants and patios. After lunch, we can continue the tour out of Kempenfelt Bay and around Big Bay Point (Map Point F) to head along the southwestern shore down into Cook’s Bay where the entrance to the Holland River lies (Map Point G). The Holland River is a narrow speed run on perfectly calm water in area known as the Holland Marsh. It’s not far in or out but it’s worth the trip. Once we exit the Holland River we can head up though Crate’s Marina and under the road bridge to Boston Pizza (Map Point H) and their lovely patio. This trip was designed to be a two day riding affair at a fairly leisurely pace with both rides beginning in Hawkesbury. The first day is a 122 mile ride from Hawkesbury to Ottawa (and back) and the second day, Hawkesbury to Montreal (and back) adding another 100 Miles. The Town of Hawkesbury is located on the Ottawa River and with the Long Sault Bridge crossing the river, it is the gateway between Ontario and Quebec. Just off this bridge on the Ile du Chenail, is our launch point (MapPoint A) at the Tourist Information Centre of Hawkesbury. It has a steep, well maintained boat launch, parking and washrooms. The fee is $10.00 perday - launch and parking with trailer. From here we head west along the Ottawa river which is generally no more than half a mile wide. Even in windy conditions this can still be a pleasant ride through the valley overlooking farms, marshes and some impressive real estate. You will also notice a number of ferry stations running cars back and forth across the river. As you approach Ottawa, it’s a good idea to fuel up at the Kitchissipi Marina (Map Point D) of Gatineau located on the Quebec shore north of Kettle Island. Coming into Ottawa you will notice the fine real estate of Rockcliffe on the Ontario shore leading up to the Rideau Falls right near 24 Sussex Drive, the Prime Ministers residence. There is a good photo op in front of the falls. Progressing under the Autoroute de la Gatineau and the Alexandra Bridge we arrive at our destination underParliament Hill. The view here is spectacular with many, many photo ops. You can see the set of 8 flight locks that provide a 79 foot drop of the Rideau Canal into the Ottawa River. We were careful with our speed here as a Police boat was patrolling the area. We stopped to speak with them to find them very friendly and helpful with our questions regarding the local water area. We were told that the big police boat In the area is worth $182,000.00…so you are probably not going to outrun it! On your way out of Ottawa you can take a short side trip turning left before the river narrows. Go under the Autoroute de L’Outaouais keeping to the left to stop a the “Control Station” where they take your name and give you the rules to enter the controlled waterway which comprises Leamy Lake and the Casino “lake”. Once past the casino you enter into a small lake that has one of the biggest water fountains in the world at its center. It’s a very pretty place. This area is all idle speed with buoys to direct your course. If you stray from the rules, the “casino police” will be all over you. They definitely don’t have a sense of humour when you cross Leamy Lake straight in the middle (outside of the buoy markers) or stray over to the beach area….we found out that out the hard way! No tickets, just a polite “follow the rules” speech. This side trip is interesting once but not really worth doing if you are on a schedule. Once back into the Ottawa river, it’s just a short jaunt over to the Ontario side again at the narrows, to The Boathouse patio for lunch and refreshments. You can top up your tank here or wait to get back to the Kitchissipi Marina which is a bit easier and not quite as busy. Fuel prices were the same. From here it’s the long fast run back to Hawkesbury. On day two, we head from Hawkesbury to Montreal. This can seem like a big water trip on a windy day so check the wind speed and direction at sailflow.com before you start. Waves from the wind plus the boat wake near Montreal will make for a rough day. After 12 miles out of Hawkesbury, we come to the Carillon Lock which raises and lowers boats 20m or 80 feet and uses 17 million litres of water each time it empties.. This lock is quite unique in North America in that it has a 182 tonne guillotine style gate at one end. Depending on your timing this lock can take up to an hour and a half to get through. The minimum time to get through is about 40 minutes. To ensure good timing for the day, it is recommended that you leave Hawksbury around 8:30 am to arrive at the lock for the first drop. Lock fees are $10.00 each time you use it (ie coming and going). They take your Visa card right there on the dock inside the lock. The police boat may be in the area and they ask for your boating card and your vessel license so it’s a good idea to have both on board. As part of this lock, the Carillon Generating Station is a hydro electric power station. Built between 1959 and 1964 it is managed by Hydro Quebec and has a capacity of generating 752 MW. The Carillon Canal, a National Historic site, opened in 1833, bypassed the rapids of the Ottawa River, especially those at Long Sault but upon completion, the dam raised the water level by over 62 feet (19 m) at Carillon and over 9 feet (2.7 m) at Grenville. This inundated the rapids of Long-Sault, transforming them into calm (deeper) water. The lock now facilitates boat traffic up the Ottawa River superseding the Carillon Canal. Once through the lock we can continue to Montreal to the next lock at Sainte Anne de Bellevue (Map Point C) where the Ottawa River meets the St. Lawrence River. There are many, many patios at this lock to satisfy your thirst and hunger. This would be the place to eat lunch if you are not going further past the lock and into the St. Lawrence. Given the amount of time to proceed through the two locks of the day, you must consider the time of day in order to arrive back at our launch point (Map Point A) at a reasonable hour. Keep in mind, you must be back at the Carillon lock by about 4:15 for the LAST LOCK OF THE DAY during the summer. The timing is much, much earlier if you travel this route before June 21 or after August 20. To give the tour a bit more interest in the Montreal area, you can return to the big bay and follow the shoreline in a counterclockwise direction around Ile Bizard (Map Point G) on the right if there is enough water depth at the Rapides de Cap-Saint-Jacques (Map Point H) (depends on the time of year or if there has been a lot of rain). If you decide to do this, you will need fuel first in order to make it back to Hawksbury. You can get it at a couple different marinas on the north side of the bay around Point Calumet. After fueling you can do this side trip up the Prairies River, though some mild rapids at the beginning, then through the channel markers along the river past some awesome real estate. It eventually stops at a dam. If you don't do the side trip up the Prairies River, you will leave Sainte Anne de Bellevue, go under the bridge and across the bay on the north side (5 miles) to Marina Bobino at Pointe Calumet (Map Point E), for gas. After refueling here, we continue the tour west along the shoreline past the long beach of the Oka National Park (Map Point F). Depending on the day, you may have to fight a lot of big boat wake to return back to Carillon. 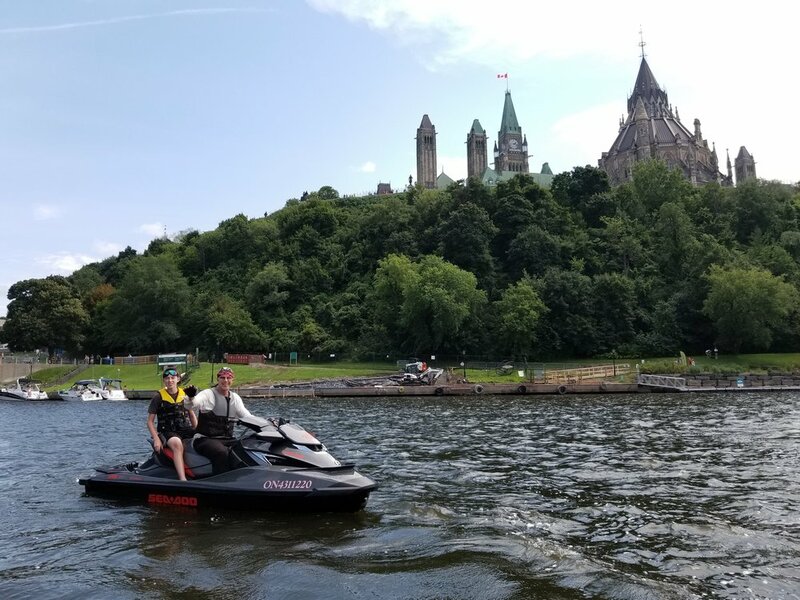 The new Seadoos with the automatic suspension systems certainly prove their worth in these conditions as you can get pounded from all directions. Its about 26 miles back to the lock at Carillon. Be sure to get back to the lock in time for the last lock of the day. Mid summer, this means getting there at 4:15 so you will have to leave the big bay by 3:30 pm. If you don't make it in time, then its taxi rides back to Hawksbury to retrieve your trailers. Once through the lock again at Carillon, it’s a fast 12 mile ride back to Hawkesbury. Leave Hawksbury at 8:30am to ensure making the first lock down at Carillon. Try to limit your lunch to 1 hour. You must leave the main big bay outside Saint Anne de Bellevue (called Lac des Deux Montagnes) by 3:30 pm in mid summer to catch the last lock at Carillon. Watch your timing carefully, especially if your do the Prairies River. This tour description was updated in Aug 2018.